Every two years, members of the New Jersey State Federation of Women’s Clubs of GFWC (NJSFWC) throughout the state support a defined special project with fundraising, in-kind donations and public awareness campaigns. 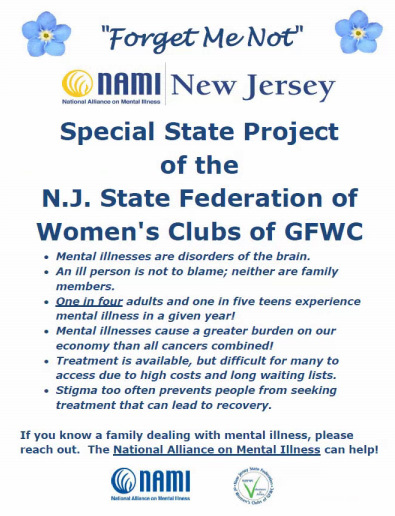 NAMI New Jersey has been selected as the Special Project for 2014-2016, offering an extraordinary opportunity to educate all communities across the state about mental illness and its impact on individuals and families through Club activities and initiatives. In addition to making the range of NAMI NJ programs and activities (from school mental health outreach to family education) available to the clubs, NJSFWC and NAMI NJ are working together to develop special activities focusing on the arts, conservation, home life and public issues. 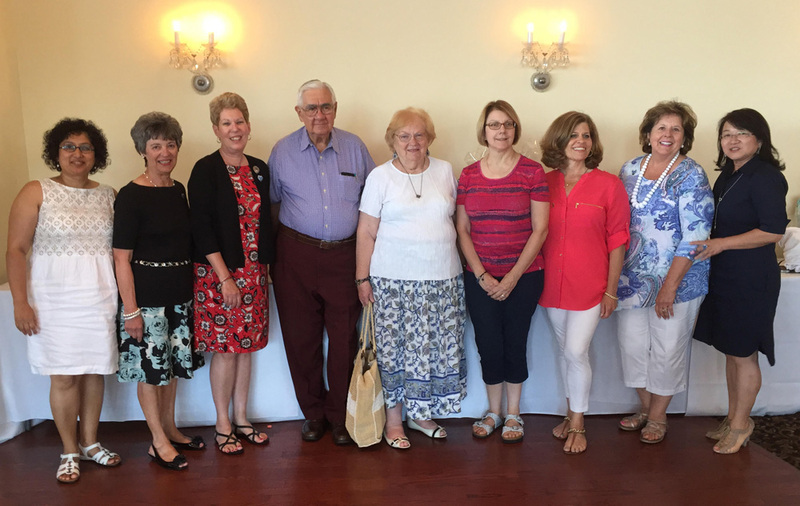 Founded in 1894, the NJSFWC, a member of the General Federation of Women’s Clubs, provides opportunities for education, leadership training, and community service through participation in local clubs, enabling members to make a difference in the lives of others, one project at a time. There are approximately 8,000 members in over 230 clubs located throughout New Jersey. Each member inherits a history of activism on the community, state, national and international level. Previous Special Projects include the Valerie Fund, Canine Companions for Independence, the Community FoodBank of New Jersey and its state-wide affiliates, and the New Jersey’s domestic violence shelters and their client families. 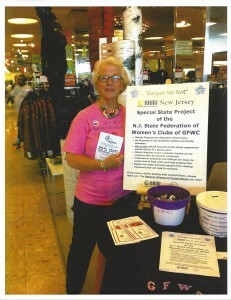 To learn more about the NJSFWC visit their website at http://www.njsfwc.org. – Ginger Siefring, Vice President and Secretary of NAMI Somerset, and Lorrie Baumann, NAMI NJ Director of School Programs, conducted a presentation to 42 members of the Women’s Literary Club of Bound Brook on January 11, 2016. 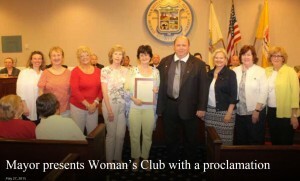 The Bound Brook Women’s Club has been a member of the NJ State Federation of Women’s Clubs since 1895. Ginger and Lorrie spoke about the programs and support and advocacy groups that NAMI NJ conducts throughout New Jersey. Read news article here. 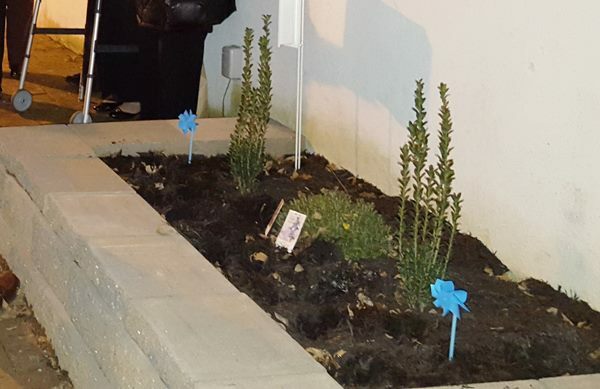 – GFWC Woman’s League of Mount Holly is proud of their “little garden” dedicated on December 4th. 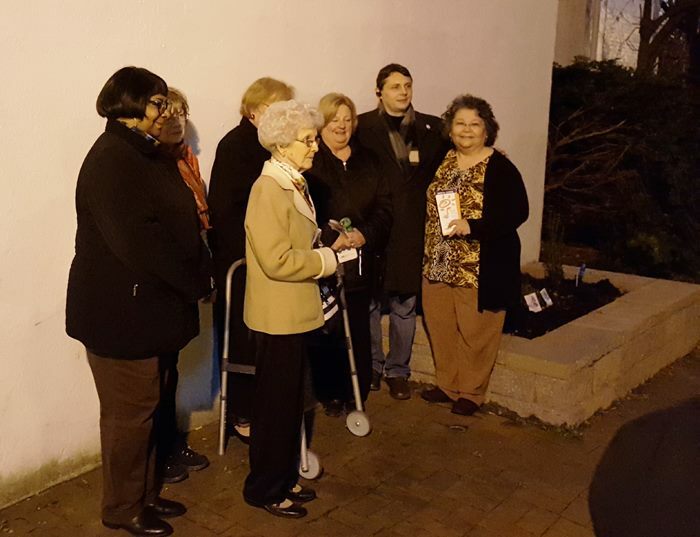 Ruth Stotsenburg and other NAMI NJ people attended and made their garden dedication very special. Several other people attended, including the Mayor of Mount Holly. 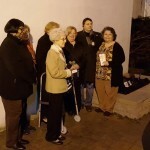 Woman’s League members, NAMI NJ members, and the Mayor all spoke on the importance of recognizing such an event. 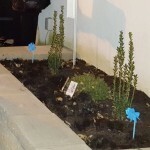 They intend to continue weeding and presenting the garden in a beautiful manner and plan to plant forget-me-nots in the spring for all walking down Cross Creek Alley, Mount Holly, NJ to enjoy and think about the message the garden sends. – Thursday Morning Club, Inc. of Madison, NJ. 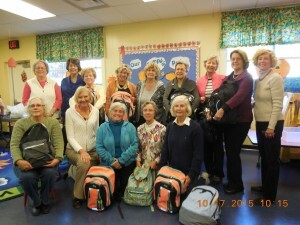 260+ club women collected and put together backpacks for NAMI. – The Junior Woman’s Club of Verona hosted “Mental Illness in our Families: Understanding the Signs and Connecting to Treatment and Support” at the Verona Community Center on November 2, 2015. Presenters included Laverne Williams of MHANJ; Montclair Police Department Lieutenant Richard Cavanaugh, the Essex County CIT Law Enforcement Coordinator; Patricia Keenan, Assistant Director of the Essex County Hospital Center; and Richard Carson, Peer Counselor at Project Live. Connie Pfiefer from the Verona Health Department moderated the panel. NAMI NJ Essex/Passaic and MHANJ offered information about their support services and other resources available. 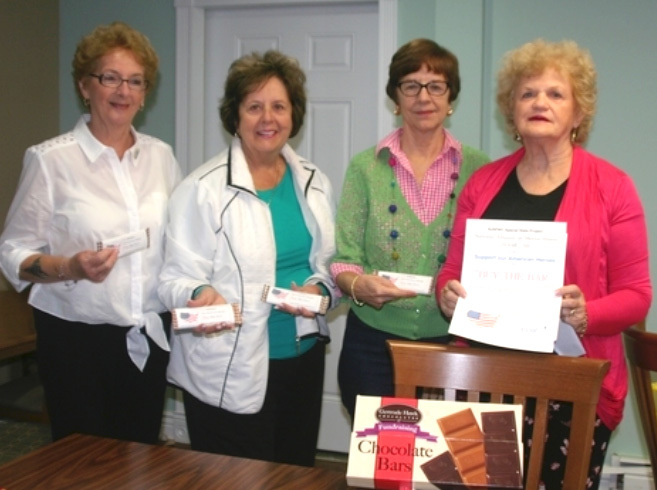 – In observance of the Mental Illness Awareness Weeek (October 4-10, 2015), the Woman’s Club of Cranbury held a sale of seed packets and pins, and arranged an In Our Own Voice presentation on October 7, 2015. 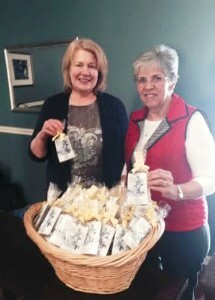 Read article on centraljersey.com, Cranbury: Growing Awareness about Mental Illness. 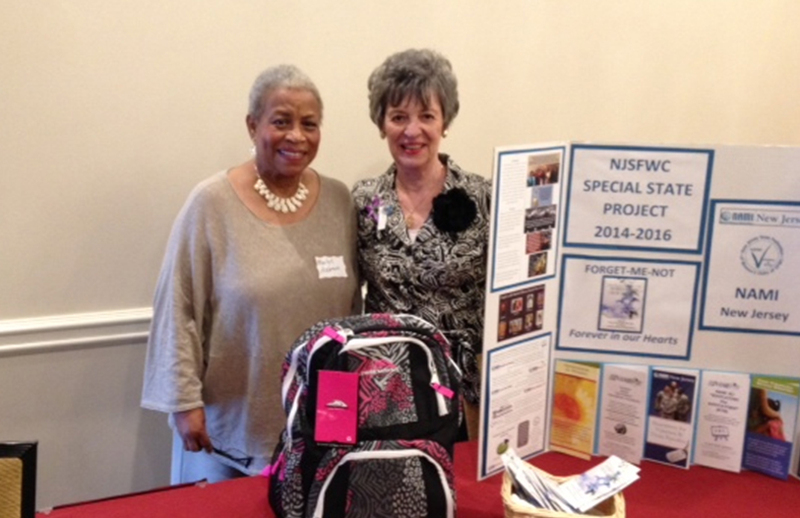 – NJSFWC Special State Project summer luncheon fundraiser was successfully held on August 5, 2015 at Lobster Shanty, Point Pleasant Beach, NJ. – NJSFWC Special State Project Display Table at the NAMI NJ 2015 Annual Meeting on June 13, with Vivien Finn (on right), Special State Project Chairman of the NJSFWC, and Marilyn Andrews (on left), Special State Project Chairperson on Mental Health of Franklin Woman’s Club 2015-2016. 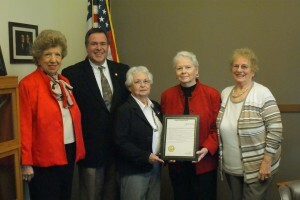 – Mayor presents Woman’s Club with a proclamation (May 27, 2015): Parsippany-Troy Hills Township Mayor James Barberio presented the Parsippany-Troy Hills Woman’s Club with a proclamation proclaiming the month of May 2015 as Mental Health Month during which time he encourages efforts on public awareness and education related to mental illness. – “Brave Voices: Raising Mental Health Awareness and the Road to Recovery,” GFWC Peninsula Women’s Club of Bayonne program with clients of the Hudson County chapter of National Alliance for Mental Illness and the Bayonne Community Mental Health Center, with free child care provided by Bayonne Girl Scouts. 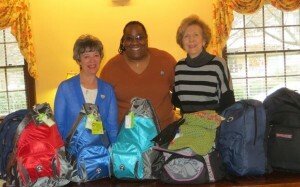 – April Wilson, President of NAMI Essex County, was presented with 7 Backpacks from the Liberty District Past Presidents’ Club, as part of the collaborative efforts between NAMI NJ and NJSFWC to care for individuals affected by mental illness. 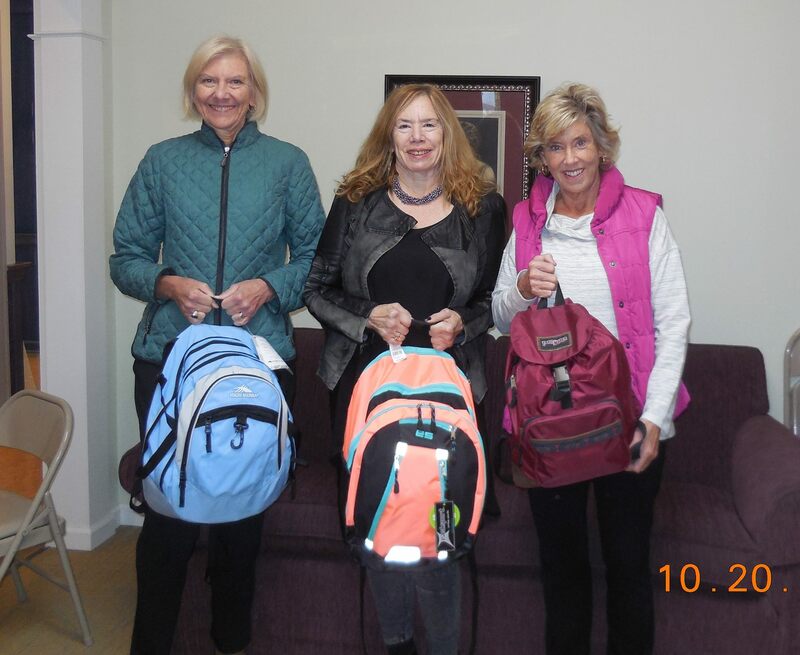 Pictured below are Vivien S. Finn (left), NJSFWC Special State Project Chairman, April Wilson, and Carol Swinburne (right), Liberty District Special State Project Chairman. Sparta Woman’s Club members – Marianne Bayliss, Club Treasurer, Marjorie Strohsahl, Highlands District Special State Project Chairman, Jill Bainbridge, Club Co-President, and Edwina Kirkowski, Club Special State Project Chairman. 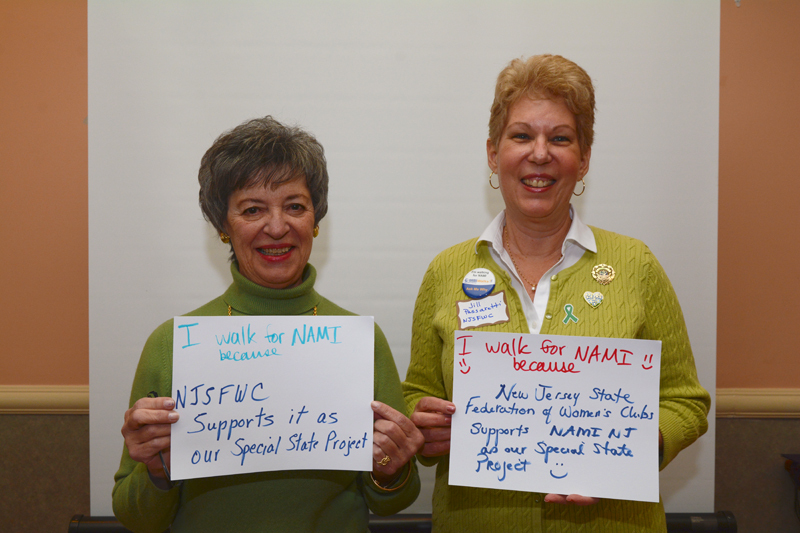 – Jill Passaretti, President, and Vivien Finn, Special State Project Chairman of the NJSFWC, announced that the NJSFWC would join NAMIWalks NJ in 2015 as a Gold Sponsor by contributing $5,000. NAMI NJ is proud to be associated with a distinguished organization with a proud support of grassroots advocacy! 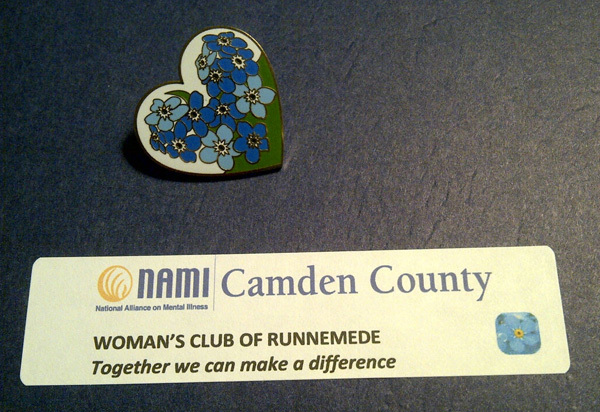 – NAMI Camden leader Marge Evers attended meetings of Marlton Woman’s Club on Nov. 24 and of Runnemede Woman’s Club on Nov. 25, 2014. 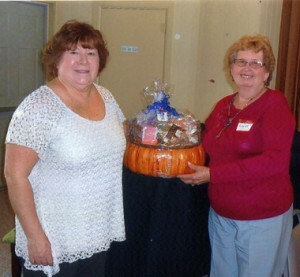 Pictured are President of the Millville Woman’s Club Linda Green and winner Virginia Gandy.